Jerry 'The Iceman' Butler, R&B Icon Ed Gordon talks with Jerry "The Iceman" Butler, the legendary R&B singer who has been an influential force in the music industry for almost half a century. Ed Gordon talks with Jerry "The Iceman" Butler, the legendary R&B singer who has been an influential force in the music industry for almost half a century. Unidentified Woman: (Singing) I remember. 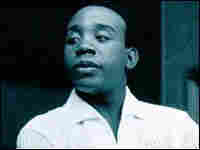 Mr. JERRY BUTLER: (Singing) I remember my first love affair. He's known as The Iceman. Jerry Butler has helped shape the sound of rhythm and blues for 50 years. In the late '50s and early '60s, Butler found tremendous success with the group The Impressions, and later launched an equally successful solo career. During this time, he recorded a string of top 10 singles, including the 1968 hit "Only The Strong Survive." Mr. BUTLER: (Singing) Yeah, you gotta be strong. Mr. BUTLER: (Singing) You better hold on. Back-up Singers: (Singing) Hold on! Mr. BUTLER: (Singing) Oh, do. Back-up Singers: (Singing) Hold on. GORDON: Fourteen years ago, Butler was inducted into the Rock and Roll Hall of Fame. He still tours. And most recently, Butler and other R&B giants--Gene Chandler, Ben E. King and Lloyd Price--performed at the world-famous Apollo Theater. The Iceman says he loves to get together with those soul music legends, and not just on stage. Mr. BUTLER: Yeah, what we used to talk about was girls, and now we talk about how many pills we take. Mr. BUTLER: But one of the things that we find, though, is that we are enjoying ourselves more. And I think we enjoy ourselves more because we're beyond the point where we think any mistake that we make is going to be career-ending. Mr. BUTLER: You know, we are at the point now where we are masters of our craft, and we just go out there and have a real good time. Back-up Singers: (Singing) Never gonna give you up. Mr. BUTLER: Whisper in his ear. Back-up Singers: (Singing) No matter how you treat me. Mr. BUTLER: You tell him that Jerry's never gonna let you go. Back-up Singers: (Singing) So don't you think of me. I was the guy that never expected to be in show business. Show business was an avocation. I--it was something that I did as a hobby. I enjoyed it. I would have sang free if I couldn't have gotten paid. And once I found out I could get paid, I took it a little more seriously, and got into it a little bit more. GORDON: Let me ask you, do you have a favorite Jerry Butler song, whether it's a solo song or one you did with The Impressions or one of your great duets, one of which I want to get into and ask you about in just a moment--But do you have a favorite? Mr. BUTLER: "For Your Precious Love" is my favorite song. "For Your Precious Love" is the one song that if I go and perform someplace and don't sing it, people want their money back. They think they've been cheated. Mr. BUTLER: (Singing) Your precious love means more to me than any love could ever be. GORDON: Let me ask you about a song that is played as often today, almost, as it was when it became a hit, and I think it's a song that people don't necessarily even know what it's exactly about. It's a hit you had with Brenda Lee Eager called "Ain't Understanding Mellow." GORDON: Talk to me about what that song--I know what it's about. But talk to me--I think people sing along and don't always get it. Tell folks what that song is about. Mr. BUTLER: The song is really about a guy and his lady breaking up. And he is saying to her that, you know, we can't be lovers but we can certainly be friends from this point on. "Ain't Understanding Mellow." Backup Singers: (Singing) Try to make it easy. Try to make it easy. GORDON: Unlike so many others, you understood that there was a possible need to grow and expand. And not only did you become a successful businessman with a beer distributorship and other ventures, but a politician in one of the hotbeds, politically, of our country, and that's in Chicago. Mr. BUTLER: Well, actually, I am a Cook County commissioner, and Chicago is the county seat. And I decided to run for political office when Harold Washington was the mayor of this town. He was the first African-American elected to that office, and he was having a terrible struggle with some of the folks on the City Council. And so myself, Chuck Bernardini, a young attorney, and Commissioner Bobby Steele--we all ran for seats on the Cook County board and we all won. And I am now serving my fifth four-year term as a Cook County commissioner. GORDON: Well, Jerry Butler, I've been a fan for a long time. It's a pleasure to talk to you. GORDON: The Iceman, Jerry Butler, joined us from our Chicago bureau. GORDON: Thanks for joining us. That's our program for today. NEWS & NOTES was created by NPR News and the African-American Public Radio Consortium. I'm Ed Gordon. This is NEWS & NOTES.